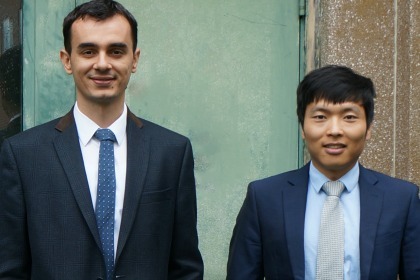 The work, led by Arvis Sulovari, a doctoral student in cellular, molecular and biomedical sciences, and Assistant Professor of Microbiology and Molecular Genetics Dawei Li, Ph.D., is the first to make a direct connection between a person’s eye color and alcohol dependence. The results of the research, published in the July issue of the American Journal of Medical Genetics: Neuropsychiatric Genetics (Part B), suggest the hope of finding the roots of not only alcoholism, but also many other psychiatric illnesses. Li came to UVM in 2012 and has studied psychiatric genetics for a decade. During that time, he has worked with physicians and scientists throughout the Northeast who have collaborated to build a clinical and genetic database of more than 10,000 individuals, mostly African Americans and European Americans, diagnosed with at least one psychiatric illness. Many have multiple diagnoses of diseases, including depression, schizophrenia and bipolar disorder, as well as addiction and alcohol or drug dependence.